Seit gestern Abend kann man sich bis zum 8.September auf dieser Seite bei Evil Hat für den Betatest der Turbo-Fate Version der Dresden Files bewerben. Lasst es uns wissen wenn ihr angenommen wurdet! Looking to play in the world of Jim Butcher’s Dresden Files without lots of prep time? 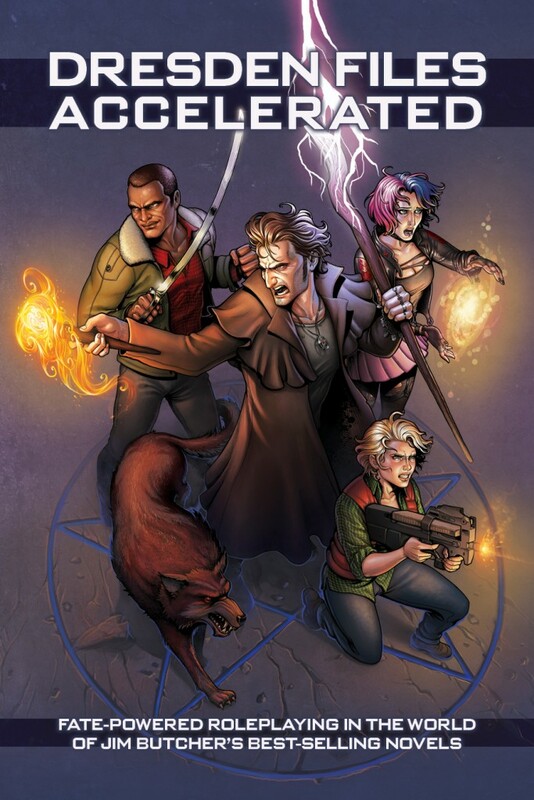 Dresden Files Accelerated is the game for you. This currently-in-development game merges the wizardly awesomeness of the Dresden Files RPG with the sleek, story-based, rules-lite Fate Accelerated system. The result? A short stand-alone game somewhere in the neighborhood of 200 pages that will get you playing easily and quickly. It’s also the only book you’ll need; you will not need to purchase any of the Dresden Files RPG books to play. Current owners of the Dresden Files RPG, do not fear! We’re all about providing options when it comes to fighting chlorofiends, summoning zombie dinosaurs, and raising blasting sticks against the darkness. We’re invested in supporting both games to give you the wizarding experience that best fits your gaming table. In fact, we’re looking at ways you can use the DFRPG books to enhance your DFAE experience. You can have your cake and eat it too, but please note that we don’t advise eating wizards. It’s just not done. More information about the book will be added here as it develops. In the meantime, prepare for wizarding made easy! Der Beitrag Bewerbt euch für den Betatest der Turbo-Fate Dresden Files erschien zuerst auf FateRpg.de.